Now Businesses have their own WhatsApp solution. WhatsApp has been working on releasing WhatsApp Business for a long time and finally it is there. WhatsApp Business is available for Android and it can be downloaded for free. The application offers you fundamental functionality, which you expect from a business app. You can create a Business profile with extra information such as address, description, contact information and more. Moreover, you can also create greeting messages and view for some simple analytics so you can check which messages are more efficacious. 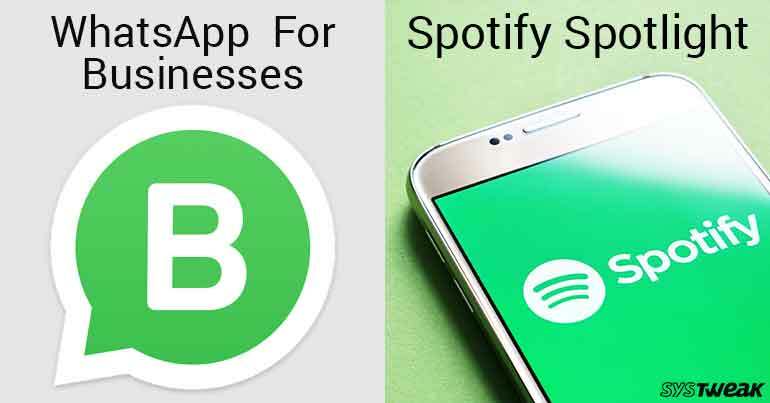 It will help you to send and receive messages with WhatsApp Business on your Windows. You will be able to send quick replies to provide fast answers to FAQs and away messages to let them know that you are out of reach for the moment. WHAT DID WHATSAPP HAVE TO SAY? As per WhatsApp Spokesperson, the latest feature is free in the long term but WhatsApp will charge for additional features in the future. Primarily, it will ultimately take on the freemium model though at least the company has no plan to take away the existing features. The app is available to download and install from Google Play Store in Italy, Mexico, Indonesia, the U.K. and the U.S for now. In the coming weeks, rest of world will also get the access to the app. Spotify launches Spotlight, a new podcast format. Spotify is not new to podcast business and it offers a large index of shows including Original Content. Today, Spotify is launching a multimedia format called Spotlight. Spotlight adds visual elements to podcasts, audiobooks, and news bites and more. Spotlight will feature stuff from Crooked Media, Gimlet Media, BuzzFeed News and more, along with the original series created by Spotify. The list of original series includes series like Secret Genius, RISE and Spotify Singles Session series with numerous artists. This could be a new way to boost up the start of the original content as Spotify didn’t get a picturesque starting. This could make Spotify stand in competition against Apple, who has been dominating the Podcast market. HOW IS IT DIFFERENT FROM OTHER PODCASTS? To make it likable, Spotify has to definitely add something different and something amazing. Spotlight plans to offer the content in playlist style. It is more like prolific media MP3 podcasts for which creators left no stone unturned. Spotlight now has beautiful and dynamic changing album artwork, with embedded links, and much more. It also consists of photos, videos, and audio with text. Currently, it is releasing for U.S. users. Well, people might take this new Spotlight for the one that got launched back in 2013, whose objective was music and artist commentary. This is an exciting experiment by Spotify, but the success depends on how people take it.